In order to fulfill my solemn duty to protect America and its citizens, the United States will withdraw from the Paris Climate Accord… I was elected to represent the citizens of Pittsburgh, not Paris. President Donald Trump has said ENOUGH to this one-sided “Paris Climate Accord” that forces Americans—especially our senior citizens—to send BILLIONS of our tax dollars to filthy and polluted third world countries which tear down our values and hate what we stand for. President Trump is taking a terrible beating from the liberal left in America, from world leaders who benefit from this “accord” and from the anti-Trump news media. 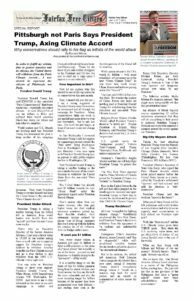 That’s why as Executive Director of the Secure America Alliance, I just sent a letter today to 15,000 of our leaders asking them to work with me to organize support for President Trump’s decision to withdraw America from the one Paris Climate Accord and go a step further to also withdraw from the 1992 U.N. Climate Treaty right now. You can write to President Trump to show your support: President Donald Trump, the White House, 1600 Pennsylvania Avenue NW, Washington, DC 20500. And write to me to stay informed on this issue as our new campaign is rolled out (ExecutiveDirector@SecureAmericaAlliance.org). 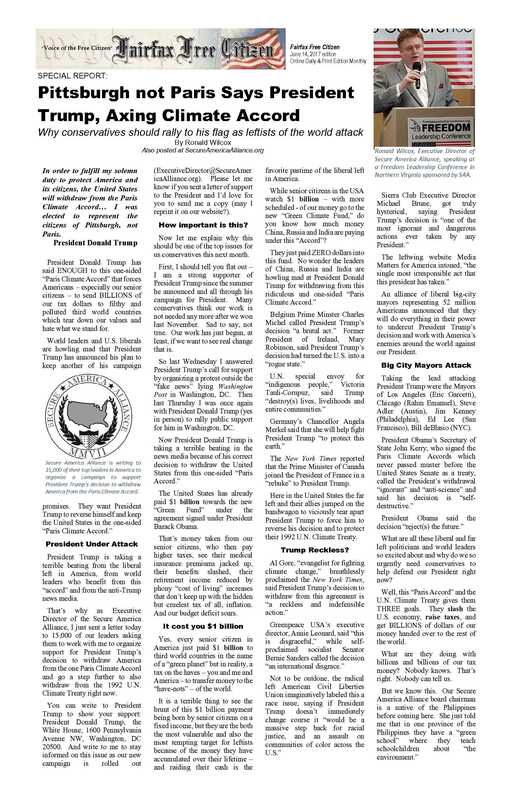 Please let me know if you sent a letter of support to the President, and I’d love for you to send me a copy (may I reprint it on our website?). Now let me explain why this should be one of the top issues for us conservatives this next month. First, I should tell you flat out—I am a strong supporter of President Trump since the summer he announced and all through his campaign for President. Many conservatives think our work is not needed any more after we won last November. Sad to say, not true. Our work has just begun, at least, if we want to see real change that is. So last Wednesday I answered President Trump’s call for support by organizing a protest outside the “fake news” lying Washington Post in Washington, DC. Then last Thursday I was once again with President Donald Trump (yes in person) to rally public support for him in Washington, DC. The United States has already paid $1 billion towards the new “Green Fund” under the agreement signed under President Barack Obama. That’s money taken from our senior citizens, who then pay higher taxes, see their medical insurance premiums jacked up, their benefits slashed, their retirement income reduced by phony “cost of living” increases that don’t keep up with the hidden but cruelest tax of all, inflation. And our budget deficit soars. Yes, every senior citizen in America just paid $1 billion to third world countries in the name of a “green planet” but in reality, a tax on the haves—you and me and America—to transfer money to the “have-nots”—of the world. It is a terrible thing to see the brunt of this $1 billion payment being born by senior citizens on a fixed income, but they are the both the most vulnerable and also the most tempting target for leftists because of the money they have accumulated over their lifetime—and raiding their cash is the favorite pastime of the liberal left in America. While senior citizens in the USA watch $1 billion—with more scheduled—of our money go to the new “Green Climate Fund,” do you know how much money China, Russia, and India are paying under this “Accord”? The New York Times reported that the Prime Minister of Canada joined the President of France in a “rebuke” to President Trump. Here in the United States the far left and their allies jumped on the bandwagon to viciously tear apart President Trump to force him to reverse his decision and to protect their 1992 U.N. Climate Treaty. An alliance of liberal big-city mayors representing 52 million Americans announced that they will do everything in their power to undercut President Trump’s decision and work with America’s enemies around the world against our President. Taking the lead attacking President Trump were the Mayors of Los Angeles (Eric Garcetti), Chicago (Rahm Emanuel), Steve Adler (Austin), Jim Kenney (Philadelphia), Ed Lee (San Francisco), and Bill deBlasio (NYC). What are all these liberal and far left politicians and world leaders so excited about and why do we so urgently need conservatives to help defend our President right now? Well, this “Paris Accord” and the U.N. Climate Treaty gives them THREE goals. They slash the U.S. economy, raise taxes, and get BILLIONS of dollars of our money handed over to the rest of the world. What are they doing with billions and billions of our tax money? Nobody knows. That’s right. Nobody can tell us. The classes—funded in part by this USA paid for “Green Fund”—are actually indoctrination of young Filipinos to teach them that the USA is the world’s biggest polluter and only more regulation, a world government, and the “Green Fund” can save them and save the earth. That’s what the money literally taken out of the pockets of Americans, is paying for—to teach schoolchildren all over the world to HATE America and HATE freedom, and love socialism. And remember, this “Paris Accord” signed by Barack Obama’s Secretary of State John Kerry was never even submitted to the United States Senate as a normal treaty. We are supposedly bound to this one-sided “accord” by order of then President Barack Obama. Under the “Paris Accord” the United States has to cut its coal energy sources in half besides giving the “Green Fund” billions. While China gets to double its coal output. And while India will increase its coal energy even more! Lets be clear about this: America’s coal energy is cleaner and safer than any other country on earth. Our Philippines-born board chairman—a real American patriot—reports residents of her country of origin have to wear filters over their face going to work because of the heavy, filthy city smog. Even on beautiful islands like Boracay, Philippines, with some of the nicest beaches in the world, people in town have to wear filters over their nose and mouth because of the heavy pollution spewing into the air. All over the world, both third world countries and industrial countries, whose factories compete with America’s factories right here on the store shelves of America, are saving BILLIONS OF DOLLARS in expenses by their filthy polluting of their own cities and of our earth. Then they denounce American freedom as the source of pollution in the world, the hypocrites. Then they hold their hand out for more of our money. They whine and complain that they cannot clean up their own pollution except with the money taken from our taxpayers and senior citizens. Thank God, President Donald Trump just told them all: ENOUGH!!! President Trump said, we’re out. Clean up your own mess, pay for it yourself, and compete on a level playing field with American business from now on.And the liberal-left in the USA and their allies in the rest of the world have gone nuts attacking President Trump, demanding that he not follow through with his announcement. Their hate fills our TV airwaves and dominates most major city newspapers in America. Their assault on our President is a massive, world-wide campaign. They demand the USA say in their one-sided “Paris Accord” must give them BILLIONS of U.S. dollars while they pay nothing. And they are scared to death the 1992 U.N. Climate Treaty is next to get the Trump axe. They demand America remain in a deal that forces us to close down our energy production while industrial and “third world” countries alike expand their pollution of the earth. Why do I say the cost of this “Paris Accord” falls unfairly on senior citizens in America? Because senior citizens, who spent a lifetime earning benefits from social security and retirement income, will see the hidden “inflation” tax, lower their real purchasing power. Far more than those who can still work a second job to make up their losses, the Paris Accords slash the standard of living of American senior citizens. Hurting America’s economy disproportionally hurts America’s senior citizens because they live on a fixed income and cannot easily get a 2nd job next year to make up for their losses this year. On the other hand, senior citizens have reason to rejoice under the policies being put in place by President Donald Trump. Under President Trump, coal mines are once again opening up in Pennsylvania, Ohio, West Virginia, and more. At last, America is developing its own energy sources and becoming energy independent. That lowers the energy costs—a fixed expense for senior citizens—and increases the income to most Americans because of the boost to our economy. And that in turn, boosts the tax base, enabling us to have lower taxes, further boosting the income and standard of living of senior citizens and all Americans. But instead of opening coal plants, America will have to shut them down under the “Paris Accords.” While our competitors in other countries will be allowed to INCREASE their factories, coal consumption, pollution. This gives them a VERY unfair advantage against American companies. This economic devastation for America is supposedly to “save the earth” but what will happen under the “Paris Accord” does no such thing. Losses of jobs from a slowed economy, increases in taxes, a diminished quality of life for all Americans, and literally pain and suffering for senior citizens who bear the brunt of these costs imposed on us by Barack Obama and his liberal allies are what we face. So this week President Trump said, no more. We’re out. America does not need any “Paris Accords” or the 1992 U.N. Climate Treaty to continue as the cleanest country on the planet earth. The Paris Accords don’t do a thing to cut back on the massive pollution, waste, filth, and corruption of the rest of the world. It just transfers money from our taxpayers and especially our senior citizens to other countries and hamstrings the USA. As Executive Director of Secure America Alliance, we are standing with President Trump against this alliance of the liberal left in America, world leaders who are attacking him and the massive news media blitz trying to make President Trump reverse course or else be crippled politically to protect their 1992 U.N. Climate Treaty. I hope you will join me in supporting President Trump in this fight. Will You Help President Trump? If you aren’t willing to stand with President Trump right now in this fight, then you cannot blame him if he reverses course or simply does not follow through on his decision as the left demands. Please send a letter to President Trump right now, and also write to me to let me know you stand with us in this fight (ExecutiveDirector@SecureAmericaAlliance.org, or visit SecureAmericaAlliance.org). President Trump’s decision has mobilized the liberal left in America and the world. If we conservatives don’t rise up to support him then he may be forced to back off on his decision to withdraw America from the Paris Climate Accord, and he most certainly wouldn’t even try to withdraw America from the 1992 U.N. Climate Change Treaty. The new “Green Fund” will take BILLIONS and BILLIONS of U.S. dollars to transfer to third world countries. They already got $1 billion! This “accord” is nothing less than an international tax on senior citizens in America, so they can transfer a lifetime of earnings from the “haves” to the “have nots” of the world. From the environmentally clean America to the filthy polluting countries of the world. Ronald Wilcox is Publisher of the Fairfax Free Citizen, Executive Director of Secure America Alliance, organizer of the Northern Virginia Tea Party, and a director of Freedom Leadership Conference. He can be reached at ExecutiveDirector@SecureAmericaAlliance.org. This article is posted at SecureAmericaAlliance.org and FairfaxFreeCitizen.com.